In resistivity surveying, information about the subsurface distribution of electrical conductivity is obtained by examining how currents flow in the earth. DC (direct current) resistivity methods involve injecting a steady state electrical current into the ground and observing the resulting distribution of potentials (voltages) at the surface or within boreholes. Like all geophysical processes, DC surveys can be described in terms of input energy, the earth’s physical properties, and signals or data that are measured. Using the same colour scheme as the flow diagram above, Figure 2 shows how this conceptual framework applies for DC methods. The energy source is a pair of electrodes that inject a known current into the ground at known locations (Figure 2a). The earth affects this energy because variations in the electrical conductivity of subsurface structures will bend the current flow lines (Figure 2b). The measured signals or data (Figure 2c) will involve measurements of voltage at the earth’s surface or within boreholes. This type of data contains information about how charges become distributed at boundaries where electrical conductivity changes. Fig. 163 Figure 2a. The energy source is a controlled DC electrical current injected into the ground. Fig. 164 Figure 2b. Increases and decreases in electrical conductivity cause current paths to converge and diverge respectively. Fig. 165 Figure 2c. Data are voltages caused by charges accumulating due to current flow. For each placement of the transmitting electrodes, voltages will be measured at different locations. Therefore, the complete data set includes measured voltages with known currents and electrode geometries. In order to create maps or graphs of raw data for quality assessment, it is usual to convert the data into a form that has units of resistivity. The data are the input for DC resistivity inversions, and the results will be 1D, 2D or 3D models of how subsurface conductivity is distributed. High power and reliable constant current are the primary requirements of DC resistivity transmitters. For small scale work (electrodes up to roughly 100 m apart), a transmitter capable of sourcing up to several hundred milliwatts of power might be adequate. For larger scale work (electrodes as much as 1000 m or more apart), it is possible to obtain transmitters that can source up to 30,000 watts. See the section DC resistivity instruments for more details. Current is usually injected as a 50% duty cycle reversing square wave Fig. 166. T hat is, current is on for several seconds, off for several seconds, on with reversed polarity, off, etc. Voltages are recorded while current is on. This pattern for the current source is necessary because a voltage measured when the current is off will be non-zero in many situations. Naturally occurring potentials are called spontaneous or self potentials (SP), and they are usually caused by electrochemical activity in the ground. From the point of view of DC resistivity surveys, SP voltages are noise because measured voltages must be caused by the source current only. The 50% duty cycle reversing square wave is employed so as to remove the (poorly known) SP signals. It is tempting to compare the earth to a resistor in an electric circuit (Fig. 167, Fig. 168). However, it is important to recognize the difference between resistance and resistivity. If we apply Ohm’s law, \(R=V/I\) we will have a resistance, which is in units of Ohms. This is not the ground’s resistivity, which has units of Ohm-m. We do not want the resistance of this circuit, we want a measure of the ground’s resistivity. First find a relation for potential due to a point source of current at the surface of a uniform medium. The expression will look like Ohm’s law with the addition of terms involving the distance between source and potential measurement location. Next, the potential due to two sources (actually, a source and a sink) is the superposition of potentials due to each one. Finally, since we must make potential measurements using two electrodes, an expression for potential difference can be derived as the difference between relations for potential at single electrodes. The actual measurement configuration can be summarized as shown in Fig. 169. This conceptualization is useful, regardless of the actual placement of electrodes on the surface. G is a geometric factor (including the factor \(1/2 \pi\)), which depends upon the locations of electrodes. \(\rho\) is the resistivity of the half-space. For heterogeneous subsurface, see the secton Data for more information about apparent resistivity. what conductivity structure is sought. For example, the location of a target may be all that is needed, or it may be necessary to characterize the details of the target. 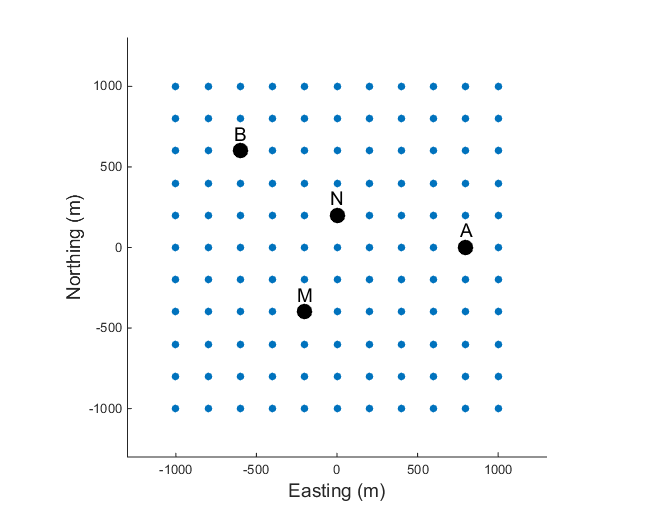 field constraints for laying out electrodes. The economics of the situation and which equipment is used. Since wires must be placed to all electrode locations, and electrodes must be planted in the ground, surveys covering large areas in difficult terrain with hard or gravelly surface materials can rapidly become very expensive. The most common specific arrays are detailed in Fig. 171 and in the interactive figure below, but there are several general types of surveys conducted on the surface. a fixed geometry of electrodes is expanded symetrically about a central point of the array. The data provide information about how the electrical structure varies with depth. The data curve is often called a “sounding” and a single sounding can be inverted to produce a 1D conductivity model. If multiple soundings are available they can be inverted in 2D or 3D. The most common sounding configurations are the Wenner and Schlumberger arrays. a fixed array is moved along a line. The data provide information about lateral variations to a depth that is determined by the length of the array. All seven types shown in Fig. 171 and in the interactive figure below can be used for profiling. These are combinations of profiling and sounding arrays. They are often obtained by defining an electrode array and expanding and translating it along a line. In practice, this is achieved by laying out a line of electrodes, each of which can be used as a current or potential electrode. The most common acquistion arrays are dipole-dipole, pole-dipole, or pole-pole arrays. This is a reconnaissance array that uses a fixed location for the A and B electrodes which are far apart. Measurements are taken in an area between the current electrodes. Potential differences in orthogonal directions can be acquired but usually only potential differences between electrodes aligned in the same direction as the A and B electrodes are obtained. Traditionally, data have been collected using co-linear electrodes. Depending upon the relative placement, the geometries have been given specific names. The interactive figure below shows how electrodes are placed for various named arrays. Electrodes placed on lines imply that the array is usually used for profiling. A circle at the array’s center implies that the array is generally expanded symmetrically about its center for acquiring sounding data.